I love cauliflower. I am no good at growing things so they gradually ripen or develop over a reasonable period of time. If I manage to grow cauliflowers they all come at once. I don’t mind this. 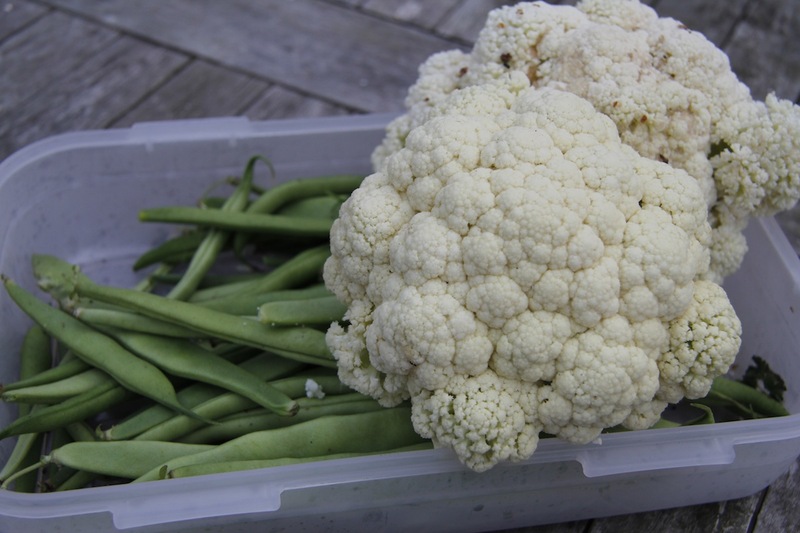 My cauliflowers are now ready – I am so excited. They survived the pigeons and the cabbage white and they have hearted up and produced lovely white florets. 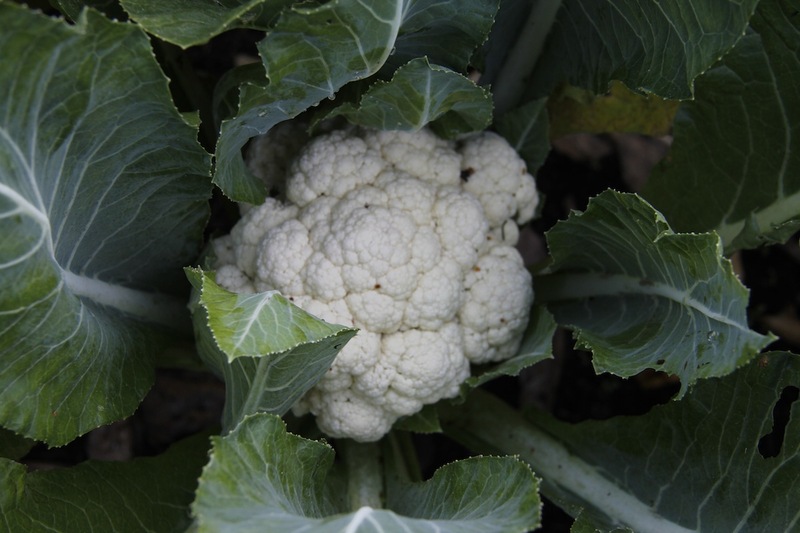 Last Sunday I made us cauliflower cheese and over the next couple of weeks we will be eating lots of different cauliflower recipes – I have a list from Ottolenghi that I want to make – I know, I am very sad, but I don’t care as they cauliflowers are ready – hurray! Cauliflower Cheese: cauliflower, cheese, milk, flour, butter, mustard, flaked almonds. 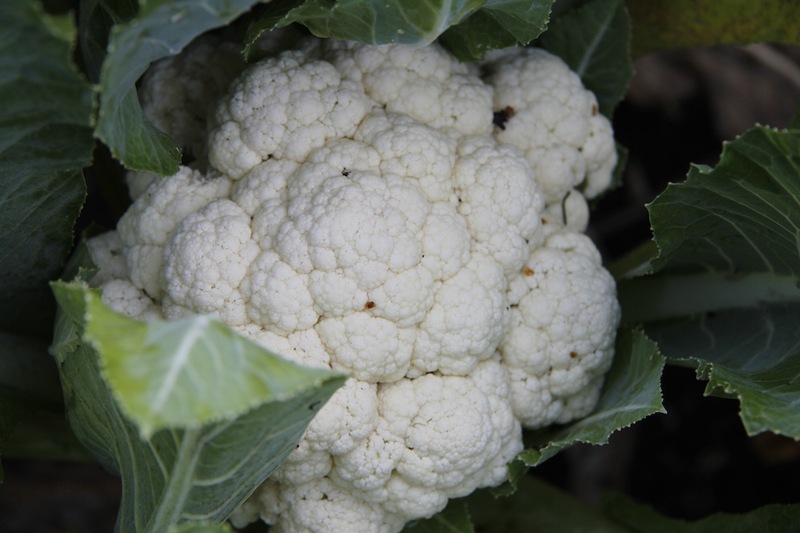 Separate cauliflower into florets. Cook cauliflower in boiling water. Meanwhile make a bechamel sauce. 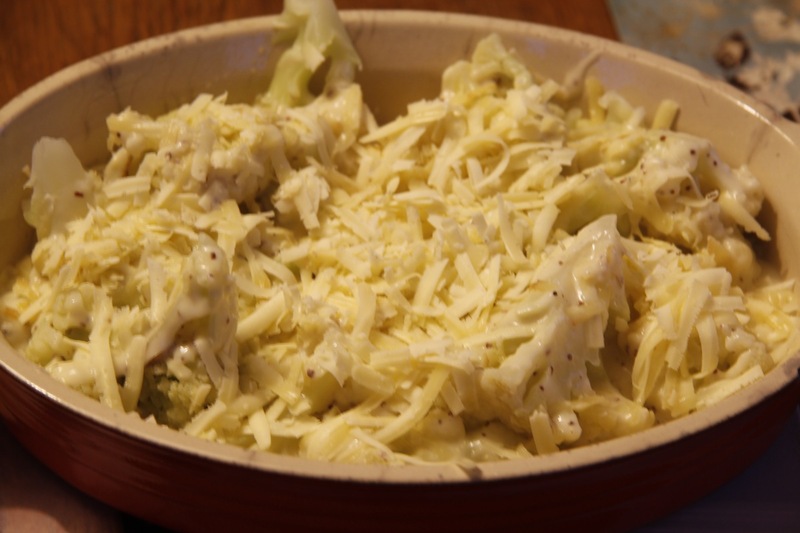 Add grated cheese to the sauce – I added the last of our Caerphilly from our last Neal’s Yard Dairy box. Put cauliflower in a dish pour over sauce, add extra cheese on top and scatter flaked almonds on the top. Cook in oven until golden – eat. We had ours with brown basmati rice. Yum yum yum. N.B. rubbish photo of the cauliflower cheese – I must learn how to take photos inside especially as the nights are drawing in now and it is dark a lot of the time. Beautiful heads of cauliflower. My attempts in the past only produced itty bitty bunch of green cauliflower that always had aphids I think and had to be pulled and tossed out. Do you grow them in the greenhouse? If so, that might be the trick. Enjoy it all. Yum.